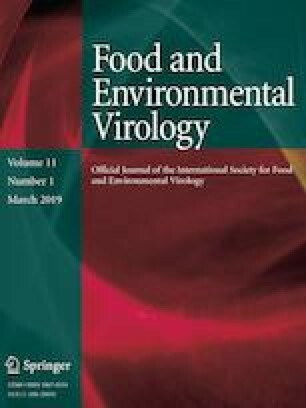 The effectiveness of steady-state levels of gaseous chlorine dioxide (ClO2) against Tulane virus (TV), a human norovirus surrogate, on berries was determined. The generated ClO2 was maintained at 1 mg/L inside a 269 L glove box to treat two 50 g batches of blueberries, raspberries, and blackberries, and two 100 g batches of strawberries that were immersion coated with TV. The standardized/normalized treatment concentrations of ClO2 ranging from 0.63 to 4.40 ppm-h/g berry were evaluated. When compared to untreated TV contaminated berries, log reductions of TV were in excess of 2.9 log PFU/g for all berry types and conditions tested, indicating that ClO2 was highly effective. In general, the efficacy of all ClO2 treatments on log reductions of TV on all berries was not significantly different (p < 0.05). The average log reduction with strawberries, raspberries, blueberries, and blackberries, treated with the lowest ClO2 concentration, 0.63 ppm-h/g, were 2.98, 3.40, 3.82, and 4.17 log PFU/g, respectively. Overall results suggest that constant levels of ClO2 could be quite effective against foodborne viruses. We thank Dr. Modesto Olanya, Research Plant Pathologist at the North East Area, Agricultural Research Service, Wyndmoor, PA, for statistical analysis of the results. Mention of trade names or commercial products in this article is solely for providing specific information and does not imply recommendation or endorsement by the U.S. Department of Agriculture (USDA). USDA is an equal opportunity provider and employer. Rulis, A. M. (2001) Agency response letter GRAS Notice No. GRN 000062. Retrieved July 26, 2018, from http://www.fda.gov/Food/IngredientsPackagingLabeling/GRAS/NoticeInventory/ucm153971.htm.